Rachel Notley grew up in northern Alberta, where she learned how to single-handedly corral horses and pull cars out of the ditch… the kind of practical skills that still come in handy every now and then. Over the past four years, Albertans have seen Rachel’s steely resolve up close. It was there after the global oil price collapse, the Fort McMurray wildfire and while she stood up to BC and a slow-moving federal government. It’s also on full display on the campaign trail. In the midst of a tough political fight, Rachel is showing Albertans her fierce determination to fight for what matters and to build one province. Few Albertans ever expected Rachel Notley to become Premier in 2015, when she defeated a 44-year Conservative dynasty with a vision of hope and renewal. And while nobody could have predicted the challenges she faced, she has showed Albertans her character. Rachel is a dog lover. She owns a three-legged rescue named Tucker, a lovable mutt who survived a car accident. Tucker loves a good scratch on the belly. 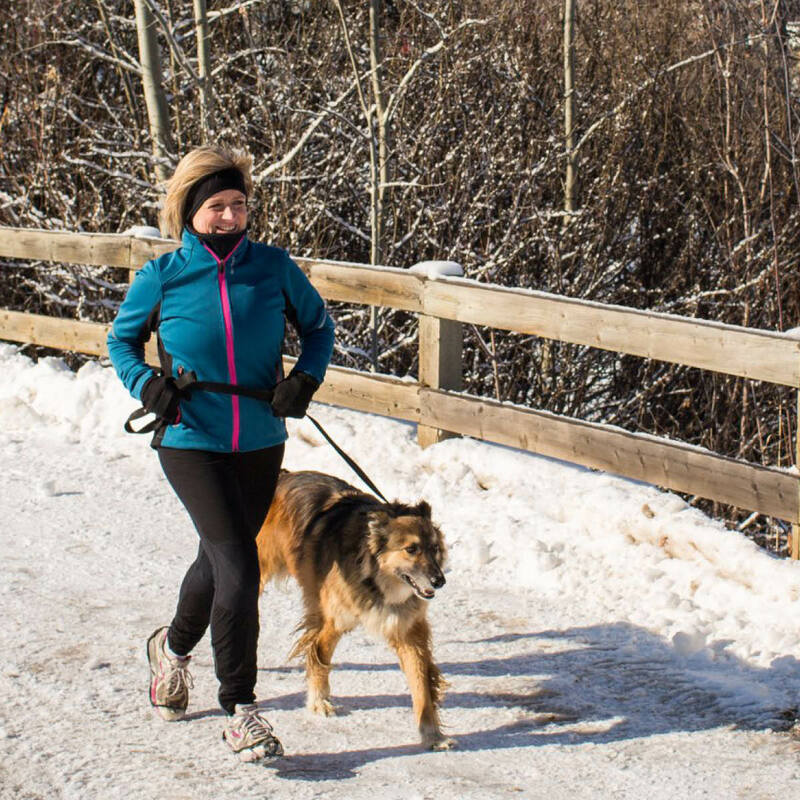 While her life doesn’t give her much free time, Rachel rarely misses a Sunday run with her friends. The group has run together for the past 16 years. Rachel also regularly competes in half-marathons. You may not know why Rachel took up running. She’s a reformed smoker who put on sneakers to replace the endorphin rush and kick the habit. Because she associated beer with smoking, Rachel switched to wine for many years. As Premier of Alberta, however, she has had the opportunity to try out hoppy local IPAs, thanks in part to Alberta's craft beer boom. While Notley is generally a healthy eater, her kryptonite is Miss Vickie’s Jalapeno chips. She has never had the fortune of introducing Miss Vickie in the legislature, but would love to one day. Also as a teen, Rachel let the air out of the tires of the family car so she could stay back and hang out with her friends from Fairview High School. After graduating high school, Rachel tested out her French skills, moving to Paris to work as an au pair for a year. One of her first tasks was to make macaroni and cheese. “Where’s the box?” she asked, to the horror of her Parisian hosts. Some might know that Rachel’s father, Grant Notley, was a tireless MLA who built the Alberta NDP from the ground up before dying in a plane crash in 1984. When Rachel was a student at Grande Prairie Regional College, she stood up at a public forum and asked her father how a student could get by with such frugal parents. Her father was furious, but gave her $20 afterwards. Rachel can be spotted at the front of the Pride parade, but she walks the walk after the glitter is swept up. As a young lawyer, Rachel worked for the Attorney General in B.C., helping set up pension benefits for LBGTQ spouses. Every Sunday night, Rachel tries to have a family movie night with her family. She’s married to Lou Arab and has two children, Ethan and Sophie. Rachel is also a big fan of Game of Thrones. Tactical politics? Rachel eats them for breakfast. Jason Kenney arrived in Alberta in a big blue truck and ten-gallon hat, hoping to convince Albertans that he’s the rightful heir. Kenney might know a thing or two about “tactical politics,” but he’s clearly underestimated the small but determined MLA from Edmonton-Strathcona. With Rachel’s prairie pragmatism and deep roots, she knows how Alberta has grown and how to take it into the future. When Albertans go to the polls on April 16, they’ll face a stark choice. But they'll have the advantage of knowing that Rachel is fighting for them.